BAKERSFIELD, CA. — Bob's Locksmith in Frazier park is looking to hand over the keys to a new owner. 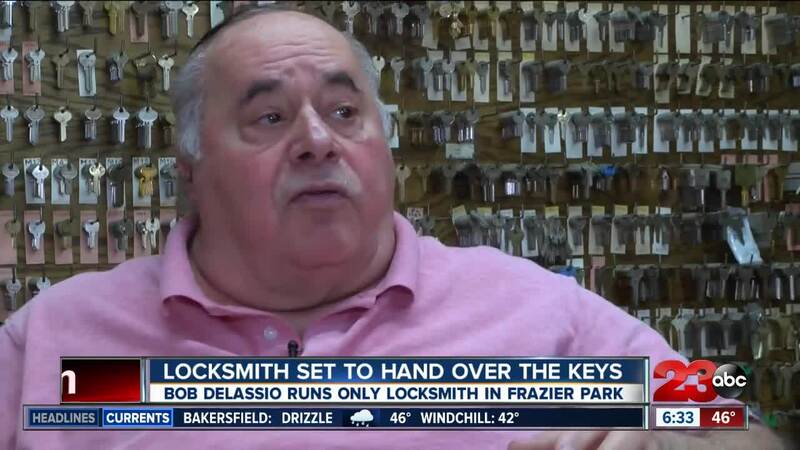 The current owner of the store, Robert Delassio, is ready to retire after 30 years in his locksmith business. But, the store has been more than a business to him. “The business I’ve done, purchased all this real estate, you know it’s given me a good life," said Bob. His locksmith career began as a hobby and when he purchased the location, he grew it from the ground up. He says at first he worked day and night to meet the needs of his calls, most of which come from beyond Frazier Park and into the central valley. But now that he's made a name for himself he is able to turn down most calls and work on a more manageable schedule. “If you just wanted to cut keys and do little things, you could make it," said Bob. "Today to start this business would be a different story." Bob says the fixed cost of the business is only $600 per month. He is also willing to include all $90,000 worth of inventory to whoever purchases the business. “Everybody owns a car, everybody owns a house, everyone has a business location," said Bob. "Locksmithing offers such a wide range of opportunities that if you’re good at what you do and you perform in a professional matter.. Its hard not to make it." If you're interested in purchasing the business you can contact Daniel Shwartz at (661) 412-1452. The original post to the listing on was on the Mountain Communities Chamber of Commerce Facebook page.